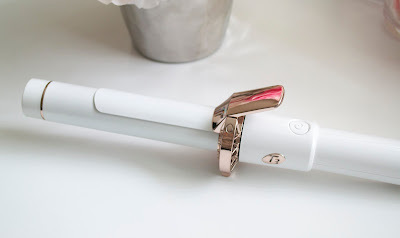 The T3 Twirl 360 Curling Iron is something that I found to be my new favorite hair tool. What’s different and unique about this iron, is that fact that it auto-rotates and has motion-sensing technology to make curling your hair so easy. To find out more info and my review, just read below! Flawless curls, powered by science. T3’s revolutionary gyroscopic curling iron features patent-pending motion-sensing technology and an auto-rotating barrel to create beautiful curls and waves with a simple turn of your wrist. The Twirl 360 senses the movement of your hand and automatically rotates in the desired direction, forming polished, perfect curls every time. With five heat settings up to 410°, two speeds, and T3 tourmaline + ceramic technology, the Twirl 360 is ideal for any hair type or skill level. It features an ergonomic design for an effortless styling experience, creating long-lasting, beautiful, lustrous curls and loose waves quickly and easily. Since my hair is so thick and wavy, I sometimes can struggle when using hot hair tools. I have used many different curling irons and my hair will fall flat and not stay throughout the day. This T3 Twirl 360 is the easiest curling iron I have used. First thing I noticed was how huge it is! I honestly thought there is no way I can use this comfortably. I really liked that there was so much room though for my hair to wrap around the barrel. Since I have long hair, it was easy to get it wrap and not have it bunched up where it won’t heat and curl evenly. A few things I loved about this: The long cord, the auto-rotating, and the temperature. I usually use the highest setting on a hot hair tool because I have so much hair, but I ended up using the fourth setting on this and it worked great. I didn’t really have any learning curve with this, I just turned my wrist the direction I wanted the curls, pressed the button, and the iron did the rest. I was able to also smooth my hair out first and then curl the ends. I can see this as something that can take practice for some, but once you get it down it is so worth it. I don’t think I can ever go back to a regular curling iron with the auto-rotation. It just makes it a lot easier to style my hair and I don’t have to worry about awkwardly turning my wrist certain ways. Product was sent for review since I am an iFabbo Member. All opinions are honest and my own. UPDATED: T3 has issued a safety recall on the Twirl 360 Motion-Sensing Auto-Rotating 1.25” Curling Iron (MSRP $230) in cooperation with the U.S. Consumer Product Safety Commission and Health Canada. Find out more information here about the recall and what you can do if you have purchased this item. Looks like something I would enjoy! That would be a purchase I'd have to make during friends & family though! Thanks for the review! This looks like something I need! My old curling iron is pretty much dead, so I'm trying to look for something new.